Turn 7 - Sauromatia's dominion has not been spreading very well up to this turn. In response (I have to assume), Dawkish left his prophet in the capitol to sacrifice blood slaves (Mictlan has been sacrificing slaves out of necessity but Panagea, Hinnom, Lanka, and Sauromatia can all do it too)(See TheDemon's correction below). His starting commander continued on to conquer the last province within his capitol circle, and his Witch King's army continued across the northern bridge to attack Lanka. You've seen from TheDemon's point of view how that move played out; there's nothing new to learn from this side. Turn 8 - Dawkish continued to push north toward Lanka's capitol. Again, you guys know all about that. His other expansion army was successful and encountered Pangaea (though not violently). 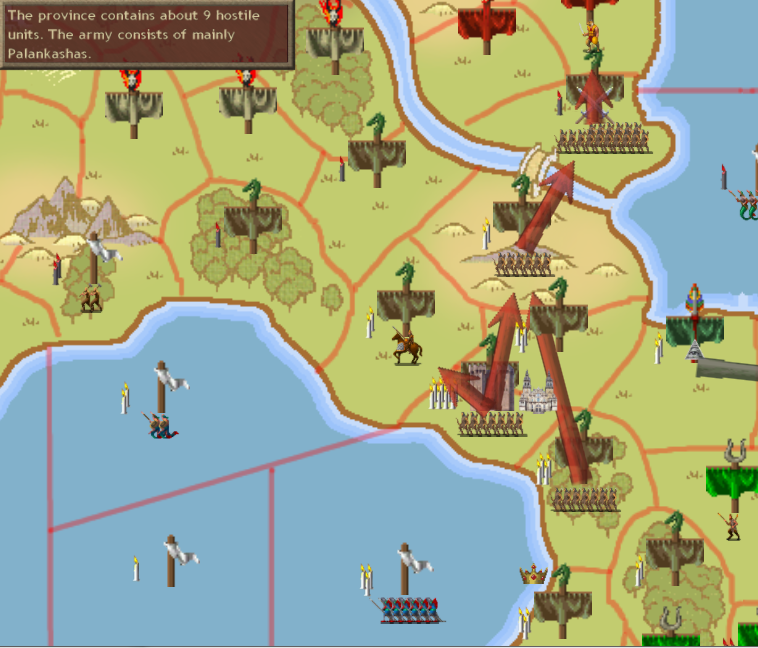 The expansion army continued southward toward a Jaguar Tribe province. Turn 9 - The army of northern incursion was all but annihilated by Lankan defenders, and the Witch King retreated south of the bridge. Meanwhile the southern armies defeated Jaguar Tribe natives and--in an accidental encounter--a Pangaean expansion force. That army then continued southward toward a province with slingers and elephants. Dawkish's first scout discovered Mictlan to the north of Pangaea, although at this point there was still one Horse Tribe independent province between them. His researchers acquired Enchantment level 3, which is where Raise Dead and Raise Skeletons become available. With "skelespam" part of the arsenal Dawkish switched to Conjuration (probably for the site searching spell Dark Knowledge). Turn 10 - The province with slingers and elephants was subdued, but Mictlan also took that Horse Tribe province. As I review these turns I find myself a little upset about that development. 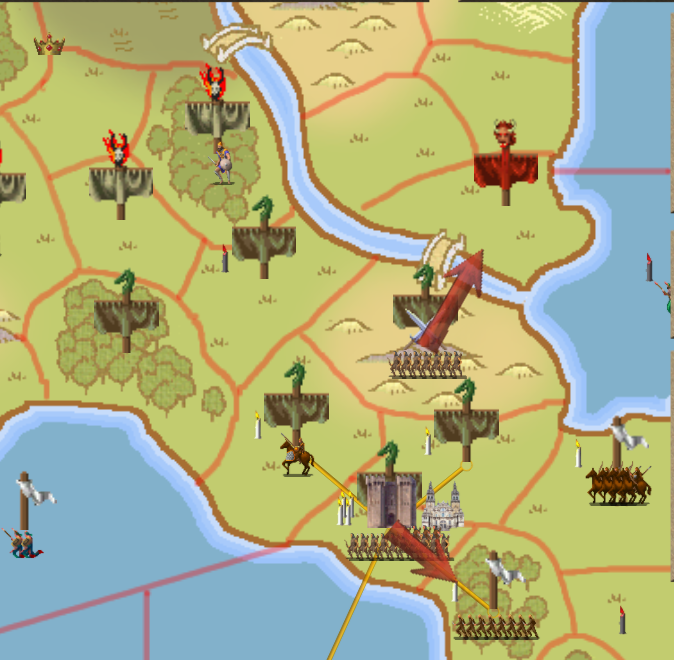 It seems to me that the Horse Tribe province was the last one that was truly part of the isthmus where Sauromatia started. There is something... intrusive about Mictlan's presence there. Watch your back, Lilli. I will have symmetry in my god game! Even if Dawkish felt the same way, there was no time for him to react because he needed to respond to Lanka's counter. He moved three Witch Kings and almost all of the troops under his command to the province on his side of the bridge. Any attacker would face waves of skeletal blockers covering for nearly eighty archers raining down poison arrows. The Witch King who had been fleeing from Lanka stopped to search for magic sites while he waited for reinforcements. Might as well! Turn 11 - All military movements are aimed at Lanka now. TheDemon stopped short of sending his big army across the bridge, and perhaps as a result Dawkish saw that as an invitation to advance. What will happen? Turn 12 - What happened was that province was basically empty when Sauromatia's armies got there. Just like last time, Dawkish decided to follow through on his attack and so he sent his skeleton-spamming Witch Kings and dozens of Androphag Archers on toward Lanka's capitol (again), with reinforcements streaming along the length of the empire. Also there was this message! 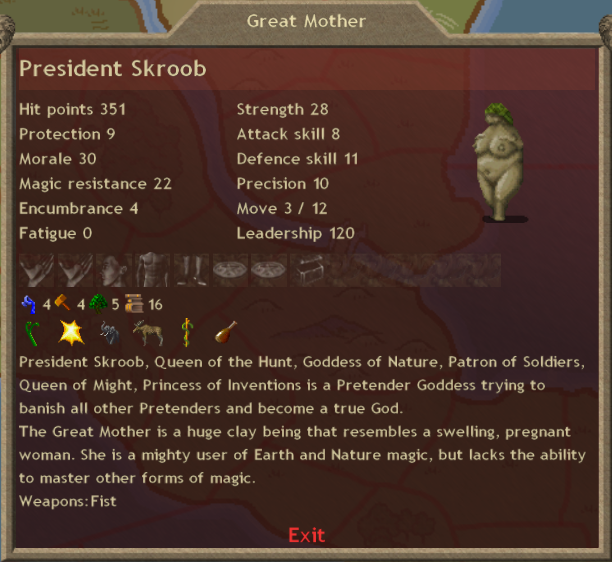 And here is President Skroob in all her swollen glory. Behold, and rejoice. The Earthmother is a titan chassis available to many nations (typically nations with Nature access). NinjaDebugger's excellent AwesomeGods mod attempts to make titan chassis worthwhile (most of them are not, in vanilla) by boosting their magical abilities (for researching, forging, and casting) without giving them an equally powerful bless. Sometimes he also throws in an added benefit, like automatically casting Friendly Currents or Storm at the start of every battle. Since all of the titans come with nice chunks of hit points, most of them can be taken Awake or Dormant and used for expansion, rush defense, or early wars of aggression. Later in the game it becomes harder to guarantee their safety, and super combatants (SCs) become more readily available, allowing them to stay in laboratories or just behind the front line where they can forge, summon, and spread dominion. That's the idea, anyway. I have no idea what zaniness President Skroob is going to get up to. We can find out together... later.